House Tharn came to epitomize modern Nibenese nobility with Abnur as its patriarch. Abnur's immediate family is very large, with at least sixteen children across seven wives, and numerous other relatives. Most notable is his daughter, Clivia Tharn, who Abnur personally groomed from a young age for the Ruby Throne. Other family members include his daughter Septima Tharn, Magus-General of the Imperial Legion, and half sister Euraxia Tharn, Queen of Rimmen. Abnur is also the author of various texts. For almost thirty years Abnur begrudgingly advised the Longhouse Emperors, from Durcorach to Leovic. A proud Nibenese, Abnur believed the Reachmen dynasty's alien nature and low heritage made them unfit to rule. In an effort to legitimize his claim to the Ruby Throne, Leovic married Abnur's sixteenth daughter Clivia - an act which infuriated Abnur. Varen Aquilarios, the son of a Colovian duke and a powerful military leader in his own right, contacted Abnur in secret and sought his assistance to depose Emperor Leovic. Abnur eagerly agreed and provided Varen with intelligence about the Imperial City, which ultimately led to Leovic's death in 2E 577. Varen declared himself Emperor, and for Abnur's loyalty and assistance he agreed to take his daughter Clivia as his bride. Seeking to legitimize his rule, Varen embarked upon a quest with Abnur Tharn, Lyris Titanborn, Sai Sahan and Mannimarco for the lost Amulet of Kings. Mannimarco believed it could be used in a ritual to persuade Akatosh to anoint Varen as Dragonborn. After two years of searching, the Five Companions finally recovered the Amulet from Sancre Tor. Ultimately, Mannimarco betrayed Varen and corrupted the ritual. An explosion of arcane energy, called the Soulburst, caused Varen to vanish, and its mystical aftershocks swept across Nirn in 2E 578. In the ensuing chaos, the Daedric Prince Molag Bal deployed Dark Anchors and began pulling Nirn into his realm of Coldharbour to merge the two together, a process known as the Planemeld. After Mannimarco's betrayal, Abnur had no choice but to hand the reins of the Empire over to the King of Worms. 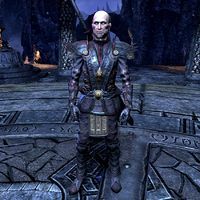 To ensure the dominance of necromancy over all other forms of magic, Mannimarco immediately cast the Mages Guild out of the Imperial City, then had all remaining dissenters arrested as enemies of the state. To avoid execution, Abnur pledged his loyalty to Mannimarco, although some saw this move as opportunism. In return, he was granted stewardship of the Imperial City. His daughter Clivia, still the Empress-Regent, became the titular ruler of the Empire, but Mannimarco remained the power behind the throne. Despite his position, Abnur was marginalized and cloistered away in Coldharbour. Clivia was turned against him, lured by Mannimarco's promise to teach her the dark arts that would give her mastery over life and death. In 2E 582, Varen resurfaced as the Prophet. With the aid of the Soulless One and Lyris Titanborn, they rescued Abnur from Coldharbour. In return, Abnur provided Varen with the location of Sai Sahan, who was being kept prisoner in Coldharbour. With the Five Companions reformed, they traveled to Coldharbour where Abnur performed the same ritual that was attempted on Varen. However this time one of the Companions was required to sacrifice their life in order for Akatosh to imbue the Soulless One with the strength to defeat Molag Bal. Because Abnur was the only one who knew the ritual, he could not be sacrificed. Ultimately, a sacrifice took place and the Planemeld was stopped. After Molag Bal's defeat, Abnur took the Amulet of Kings and fled to Cyrodiil. His deepest desire was to unite the warring territories under a single banner. Although it was suspected Abnur would attempt to use the amulet, possibly to further that goal, unbeknownst to him its power had been expended for at least a generation.